The small but classic Greek Revival building remains the visual hub of the community. Old photographs (Picture Galary) of the church, shortly after its construction, are perfect representations of it as it appears today. 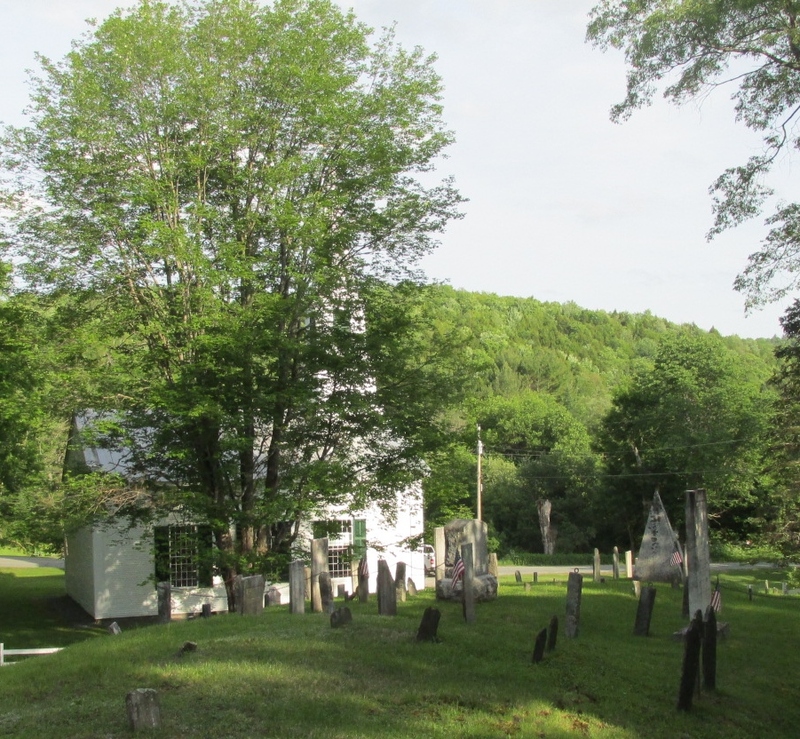 The parsonage disappeared, the general store is a private home, the brick schoolhouse is now a community center and many houses are gone.The church remains intact and is still the magnet for many of those who have roots in the village. 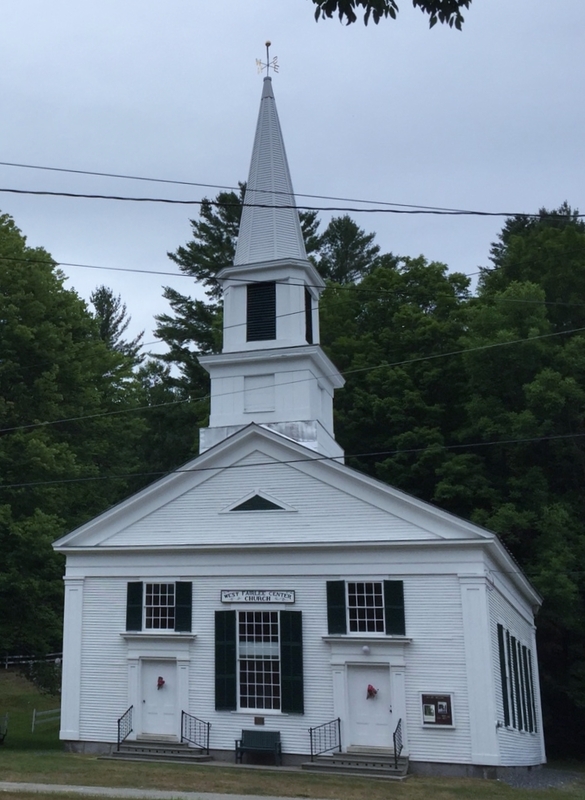 The church or meetinghouse, is a tangible symbol of the village—just as in the days of Nathaniel Niles. There are many ways to become involved which has always been a part of the uniqueness of West Fairlee Center. For more information send an email to church.wfc@gmail.com . 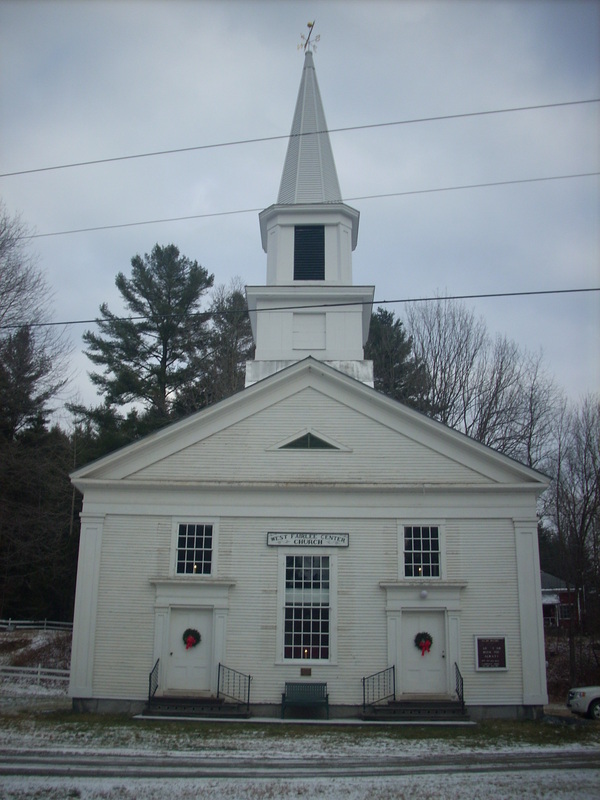 The West Fairlee Center Church was officially entered on the National Register Historic Site on June 21, 2002. The Registry application process started in 1988. The architectural significance of the church is that it typifies many of the characteristics of the Greek Revival architectural style. 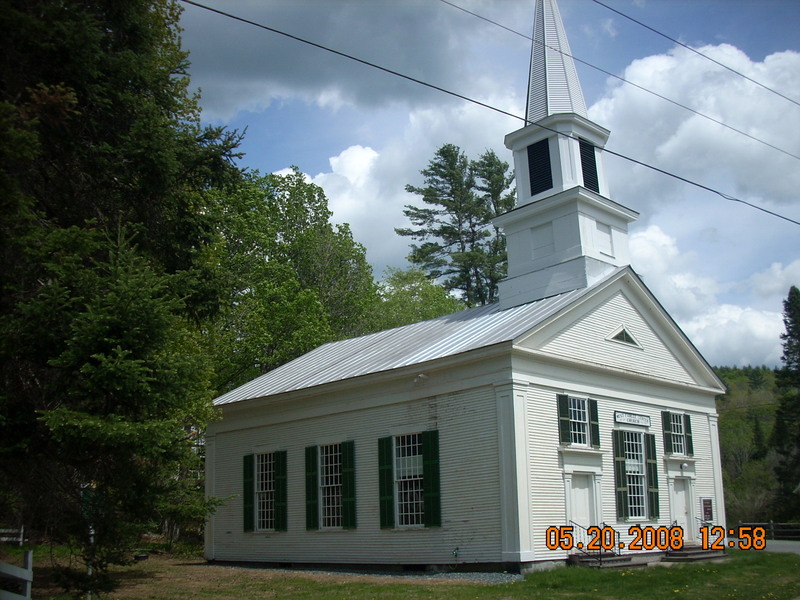 The first house of worship was built in 1811 and replaced by the present building in 1855 for a cost of $2000. The following detailed description of the church was provided by Jack Anderson/HeritageLink. "The building is a 40'x 50', post and beam framed, gable roofed, clapboarded structure set on a low unmortared rubblestone foundation. The foundation is capped by vertical granite slabs above grade. The church is oriented so that the double entry doors, located on either side of the gable end, face southward down the valley and Middlebrook Road. Each entry features a classical door surround with entablature, topped by an 8/8 window. The gable end also has a triangular gable fan, pediment, corner pilasters, and full entablature in the Greek Revival style. Between the entries on the first floor is a tall, 20/20 window flanked by long, louvered shutters. Large, multiple pane windows along both eave sides of the church provide light to the sanctuary. 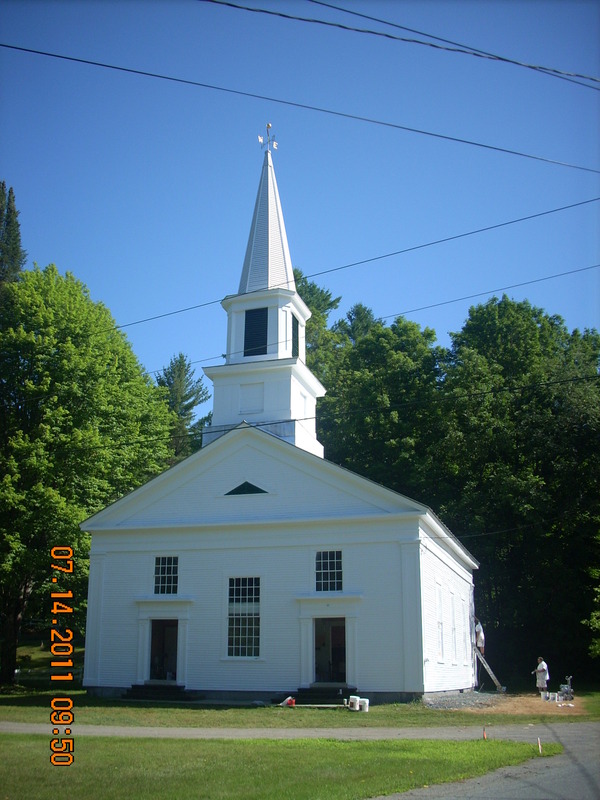 The church has a louvered steeple, topped with a hexagonal spire." 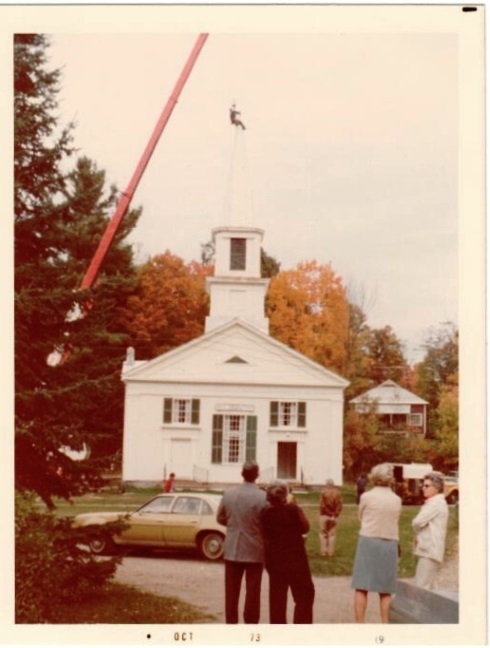 One of the first major projects in recent times was the steeple restoration in 1973. 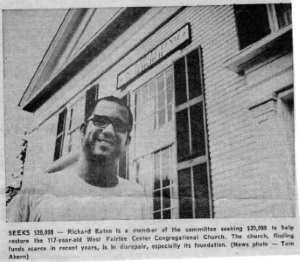 In a Valley News article, title: ‘West Fairlee Center Residents Striving to Save Their Church’ written at the time covered the steeple restoration project. 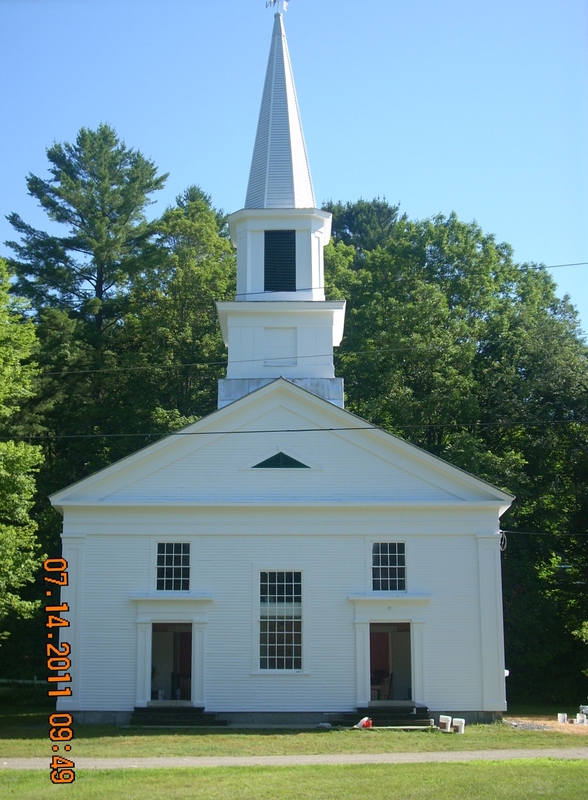 The article stated that the 15 church members set out to raise $20,000 to restore parts of the foundation and the steeple which the church members feared would tumble from the roof. 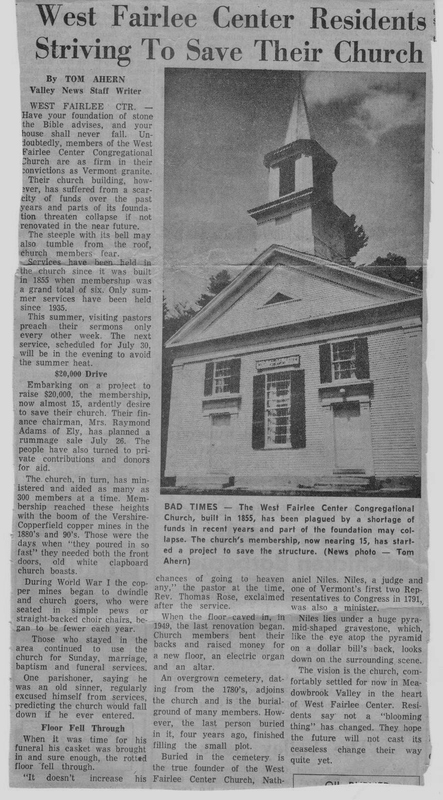 The Valley News Article continues that buried in the cemetery next to the church is the true founder of the West Fairlee Center Church, Nathaniel Niles. Niles, a judge and one of Vermont's first two Representative to Congress in 1791, was also a minister. Niles lies under a huge pryamid-shaped gravestone, which, like the eye atop the pyramid on a dollar bill's back, looks down on the surrounding scene.The vision is the church, comfortably settled for now in Meadowbrook Valley in the heart of West Fairlee Center. To read the full article, click here. Since 1999, a small group of members (now less than 15), set out to raise funds to restore the Church. The restorations were extensive. Through their hard work, the Church has been beautifully preserved. However, it is hoped that restoration does not reach a crisis situation in the future. Any building and one that is over 160 years old will always need maintenance to keep this National Historic Site in good condition.